The nicest, most unique apartments in Rhode Island are at Royal Mills Riverpoint, just 15 minutes south of downtown Providence. 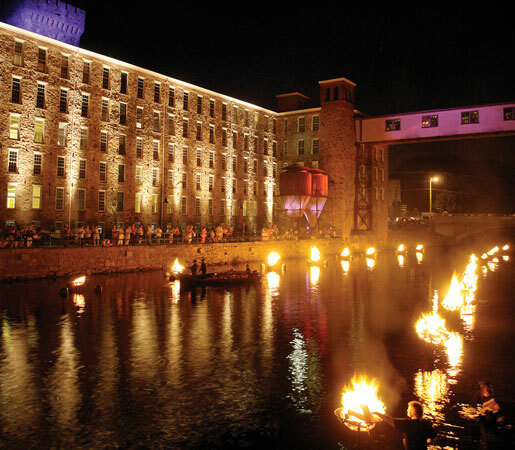 Royal Mills “loft style” apartments enjoy a scenic riverside location featuring a waterfall, outdoor fire pit, bike trail, and river walk all located just minutes between Rhode Island cities, beaches, and suburbs. FALL SPECIAL: $500 off our security deposit – usually 1 month’s rent. Studio apartment available for $985 1bd/1bth ranging from $1100-$1450 2bd/2bth ranging from $1565-$1620 Included in all of our apartments; HEAT, WATER, TRASH AND 1 PARKING SPACE! Royal Mills apartments feature exposed wood, brick, and beams like nowhere else in Rhode Island (possibly the world). And there’s more. Riverwalk. Waterfall. Hydro-power. Here are just a few amenities around the 15 acre Royal Mills apartment community. Royal Mills apartments feature over 70 distinct floorplans. No cookie cutter living here. 2bds, 1bds, lofts, 1 story, 2 story: get a taste. Cotton mill. Factory concerns. A warehouse. Once abandoned, now recycled and rejuvenated, this place houses 110 years of history.